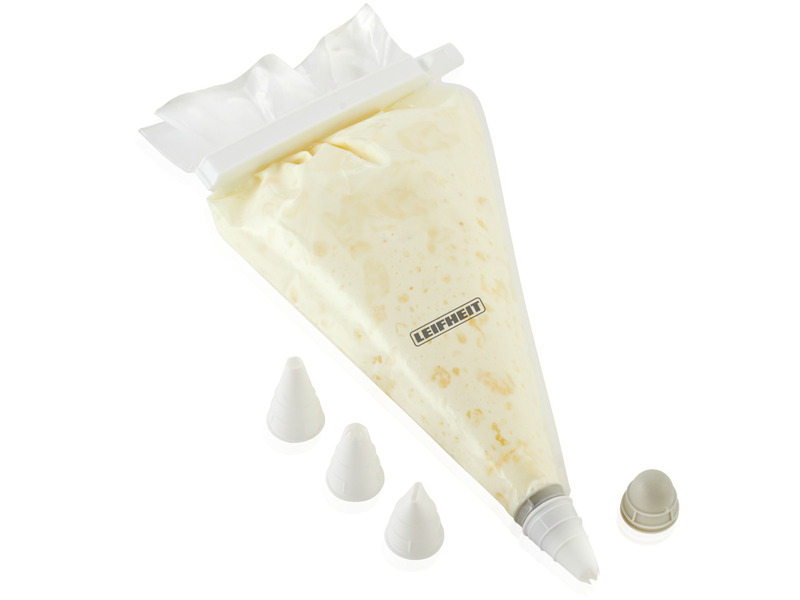 Disposable set for fine and successful decorations on cakes, buffets or desserts. Included in the set: 10 disposable piping bags, 4 fittings (2 star fittings, 1 round fitting and 1 half moon), 1 adapter for changing the fitting from the outside, 1 storage cap and 1 sealing clip. The perfect set for decorating cakes, buffets or desserts to your heart's content with fine and successful decorations. In addition to 10 disposable piping bags, four different fittings are included in the Leifheit disposable set for a variety of shapes and patterns. The special feature here: Changing the fitting takes place cleanly and hygienically from the outside. Once the adapter is inserted into the bag, the fittings can be changed as you please - without your hands coming into contact with the dough or the cream. If the decorations should be particularly fine, you can work directly with a tear-resistant plastic bag without a fitting. Simply cut a hole of the desired size. In this way, the hole size can be individually varied. Particularly convenient: If there is cream or dough left over, it can be kept stored in the piping bag if sealed all around. Screwed onto the adapter on the outside, the storage cap closes the bottom of the bag securely while the bag can be closed at the large opening with a sealing clip to seal in the aroma and flavour. Included in the set: 10 disposable piping bags, 4 fittings (2 star fittings, 1 round fitting and 1 half moon), 1 adapter for changing the fitting from the outside, 1 storage cap and 1 sealing clip.